National Aeronautics and Space Administration scientists have designed the concept of a spacecraft that would hitch rides on comets and asteroids by spearing them with tethers. Comet Hitchhiker is a concept for orbiting and landing on comets and asteroids using the kinetic energy -- the energy of motion -- of these small bodies. "Hitchhiking a celestial body is not as simple as sticking out your thumb, because it flies at an astronomical speed and it won't stop to pick you up. Instead of a thumb, our idea is to use a harpoon and a tether," said Masahiro Ono, the principal investigator based at NASA's Jet Propulsion Laboratory, Pasadena. A reusable tether system would replace the need for propellant for entering orbit and landing, so running out would not be an issue, according to the concept design. While closely flying by the target, the spacecraft would first cast an extendable tether toward the asteroid or comet and attach itself using a harpoon attached to the tether. Next, the spacecraft would reel out the tether while applying a brake that harvests energy while the spacecraft accelerates. Once the spacecraft matches its velocity to the comet or asteroid it is ready to land by simply reeling in the tether and descending gently. When it's time to move on to another celestial target, the spacecraft would use the harvested energy to quickly retrieve the tether, which accelerates the spacecraft away from the body. "This kind of hitchhiking could be used for multiple targets in the main asteroid belt or the Kuiper Belt, even five to 10 in a single mission," Ono said. Ono and colleagues have been studying whether a harpoon could tolerate an impact of this magnitude, and whether a tether could be created strong enough to support this kind of manoeuvre. Researchers have come up with what they call the Space Hitchhike Equation, which relates the specific strength of the tether, the mass ratio between the spacecraft and the tether, and the change in velocity needed to accomplish the manoeuvre. "In Comet Hitchhiker, accelerating and decelerating do not require propellant because the spacecraft is harvesting kinetic energy from the target," Ono said. For any spacecraft landing on a comet or asteroid, being able to slow down enough to arrive safely is critical. 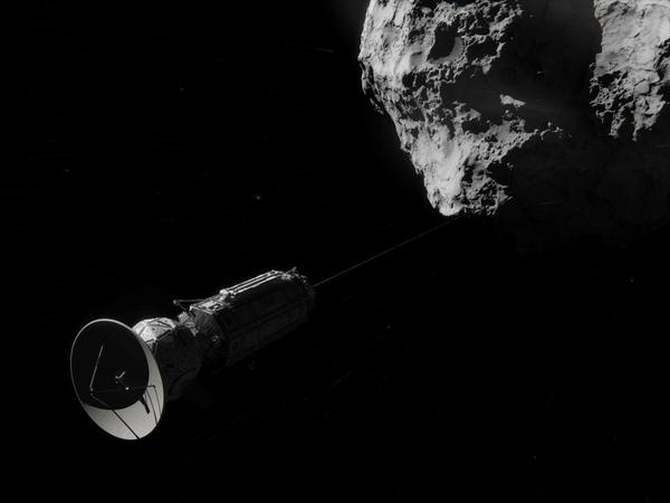 Comet Hitchhiker requires a tether made from a material that can withstand the enormous tension and heat generated by a rapid decrease in speed for getting into orbit and landing. Ono and colleagues calculated that a velocity change of about 1.5 kilometres per second is possible with some materials that already exist: Zylon and Kevlar. Researchers also estimated that the tether would need to be about 100 to 1,000 kilometres for the hitchhiking manoeuvre to work. It would also need to be extendable, and capable of absorbing jerks on it, while avoiding being damaged or cut by small meteorites.